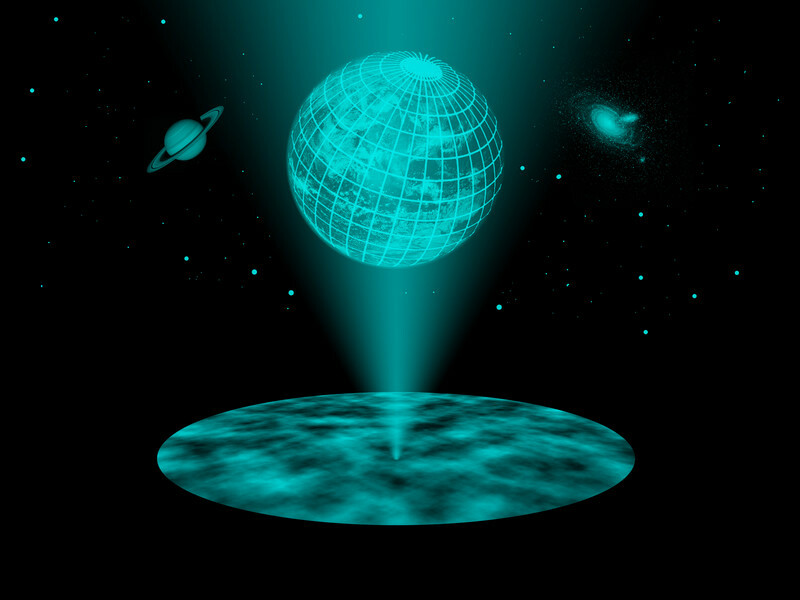 At first glance, there is not the slightest doubt: to us, the universe looks three dimensional; however, the “holographic principle” asserts that a mathematical description of the universe actually requires one fewer dimension than it seems. In short, what we perceive as three dimensional may just be the image of two dimensional processes on a huge cosmic horizon. Everybody knows holograms from credit cards or banknotes. They are two dimensional, but to us they appear three dimensional. “In 1997, the physicist Juan Maldacena proposed the idea that there is a correspondence between gravitational theories in curved anti-de-sitter spaces on the one hand and quantum field theories in spaces with one fewer dimension on the other”, says Daniel Grumiller (TU Wien). In short, this is about surfaces, not imaginary holograms. Gravitational phenomena are described in a theory with three spatial dimensions, the behaviour of quantum particles is calculated in a theory with just two spatial dimensions—and the results of both calculations can be mapped onto each other. Such a correspondence is quite surprising. It is like finding out that equations from an astronomy textbook can also be used to repair a CD-player. But this method has proven to be very successful. More than ten thousand scientific papers about Maldacena’s “AdS-CFT-correspondence” have been published to date. For theoretical physics, this is extremely important, but it does not seem to have much to do with our own universe. Apparently, we do not live in such an anti-de-sitter-space. These spaces have quite peculiar properties. They are negatively curved, any object thrown away on a straight line will eventually return. “Our universe, in contrast, is quite flat—and on astronomical distances, it has positive curvature”, says Daniel Grumiller. “If quantum gravity in a flat space allows for a holographic description by a standard quantum theory, then there must by physical quantities, which can be calculated in both theories—and the results must agree”, says Grumiller. Especially one key feature of quantum mechanics—quantum entanglement—has to appear in the gravitational theory. When quantum particles are entangled, they cannot be described individually. They form a single quantum object, even if they are located far apart. There is a measure for the amount of entanglement in a quantum system, called “entropy of entanglement”. Together with Arjun Bagchi, Rudranil Basu and Max Riegler, Daniel Grumiller managed to show that this entropy of entanglement takes the same value in flat quantum gravity and in a low dimension quantum field theory. “This calculation affirms our assumption that the holographic principle can also be realized in flat spaces. It is evidence for the validity of this correspondence in our universe”, says Max Riegler (TU Wien). Does A Great Filter Solve the Fermi Paradox?